The Game of Thrones television series closely follows the multiple storylines of the A Song of Ice and Fire series written by George R. R. Martin. The author Martin has stated that the shows pilot script was very faithful to his work. Game of Thrones is set in the Seven Kingdoms of Westeros, where it is said that summers span decades and winters can last a lifetime. Game of Thrones chronicles the violent dynastic struggles among the kingdom's noble families for control of the Iron Throne. As the series opens, additional threats from the snow and ice covered region north of Westeros and from the eastern continent across a narrow sea are simultaneously beginning to rise. The dominant families are the Houses Stark, Lannister, and Baratheon. Robert Baratheon, King of Westeros, asks his old friend Eddard, Lord Stark, to serve as Hand of the King, or highest official. Secretly warned that the previous Hand was assassinated, Eddard accepts in order to investigate further. Meanwhile the Queen's family, the Lannisters, may be hatching a plot to take power. Across the sea, the last members of the previous and deposed ruling family, the Targaryens, are also scheming to regain the throne. The friction between these clans, and with the remaining great Houses Greyjoy, Tully, Arryn, and Tyrell, leads to full-scale war. All while a very ancient evil awakens in the farthest North. Amidst the war and political confusion, a neglected military order of misfits. 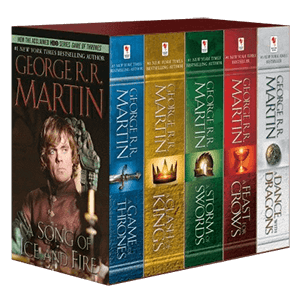 Few can deny that HBOs Game of Thrones is a hit, and it brings to life the book series first written by George R. R. Martin. The characters all have their own distinctive looks, all with subtle touches that make it more than just medieval. Westeros describes one from Westeros, and now, it describes a style too, one that you can garb yourself in by visiting the Game of Thrones Clothing section here. 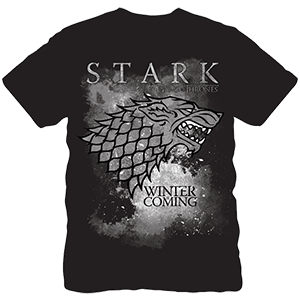 Modeled off such characters as Jon Snow and Eddard Stark, these pieces of apparel not only allow you to show off your love of the series, but also let you adorn yourself in the fashion of your favorite character. 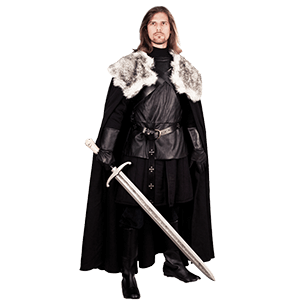 Gambesons, doublets, peascods, tunics, shirts, and more all allow you to wear the look of a Brother of the Night Watch or a noble from the House of Stark, and that is only the beginning. More clothing could be yet to come, allowing you to look like princes and princesses, and perhaps even a Khaleesi or Wildling as well! Westeros is filled with characters, and as the Game of Thrones series introduces us to ever-more people, the number of looks you can find and sport is sure to grow here as well! So if you want to transform yourself into your favorite character from a Game of Thrones, or if you just love the style of A Song of Ice and Fire, then check out our Game of Thrones Clothing here! The lands in the novel series A Song of Ice and Fire are extremely detailed. Author George R. R. Martin has left little untouched when it comes to Westeros and Essos, and that includes the fine touches like currency and coinage. And now, we are happy to offer to you a selection of stunning Game of Thrones coins that are licensed by the author himself to this amazing novel series! Each and every one of the coins found in this section are struck, which means two things for each coin. First, each and every coin is unique. Second, the coins carry an old-world style that is utterly unbeatable when it comes to collectability! 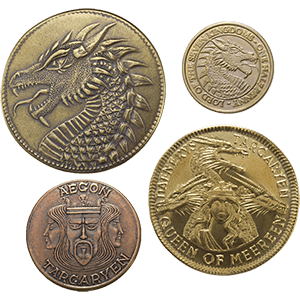 The coins mimic the currency of the realm of Westeros, as well as other nations from the novel series. You can find copper pennies, stars, stags, and dragons, all featuring the faces of figures that appear in George R. R. Martins novel series, both as main characters and as characters from the lore. 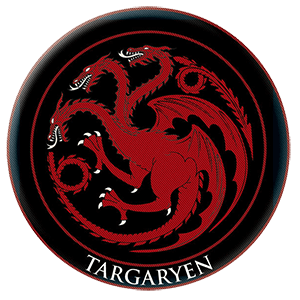 We have coins from House Stark, House Lannister, House Baratheon, and of course, the long-ruling House Targaryen! We even have the infamous iron coin given to a certain Stark by a Faceless Man! 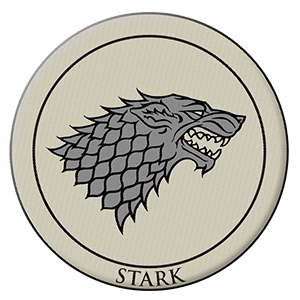 Any of the Game of Thrones Coins you will find here are sure to make for cool collectibles. The only question you have to answer is, which one do you want to get first? Sometimes it is the small things that have the biggest impact. That is why we keep our Game of Thrones decor and giftware section stocked with great trinkets and items. So that when the time comes, you can give the gift that someone really wants, or you can grab the item that you desperately need to bring a touch of Westeros to your daily life. To show your house loyalty, nothing beats a nice patch with your favorite House emblem sewn onto your sleeve, allowing you to transform even the most casual of jackets or shirts into a Westeros styled accent. 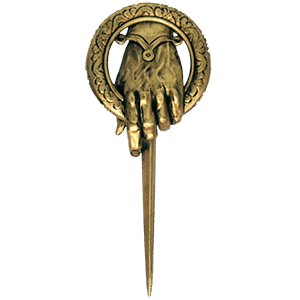 A good pin can do the same, allowing you to show off Stark or Greyjoy style with ease. You can even adorn yourself with the badge of office of the Hand of the King! We also offer things like bookmarks, coasters, magnets, and more, all so that you can sprinkle some Game of Thrones accessories around your home or office, too! Add in the low price of many of these items, and they suddenly become great everyday accents, ones that help you to keep Westeros and its many vivid characters alive in your everyday routine! So if you have a hankering for something from A Song of Ice and Fire, then pay a visit to our wide selection of Game of Thrones decor and giftware to suit your every need! While the books and the HBO series may immortalize the story of A Song of Ice and Fire and A Game of Thrones in your heart and mind, you cannot be blamed for wanting an actual piece of Westeros to remember your favorite moments, characters, and places. And now we offer a number of great Game of Thrones statues and collectibles so that you can do just that - capture a physical piece of this vibrant fantasy world! Figurines of some of the common point-of-view characters from both the books and the HBO series call this category home, including the likes of Eddard Stark, Jon Snow, Tyrion Lannister, and Daenerys Targaryen, all rendered in stunning detail in the likeness of the actors and actresses who play them. 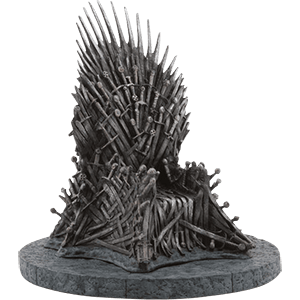 All sorts of other collectibles can be found here too, ranging from little decor pieces like snow globes and miniatures, to larger items like collectible limited edition helmets, book ends, maps, and even a replica of the Iron Throne itself! 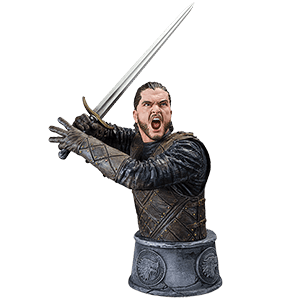 There is quite a variety of items to be found here in this Game of Thrones statues and collectibles section, and all of them will definitely sate your hunger for good GoT merchandise. And luckily, we accept the gold price, not the iron price, and our prices are low enough to make any collector and enthusiast happy! Ours is the fury. House Baratheon is of Storms End and one of the great houses in Westeros. They also had close ties to the Targaryen dynasty for some time, until the rebellion sparked a split between the Baratheons and the Targaryens. 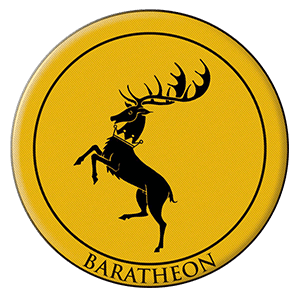 Here, we honor this young noble house, and in our Shop for House Baratheon section, allow its loyalists to easily find all Baratheon items that we carry. In the wake of Roberts Rebellion, as it came to be known, the Baratheons grew in power, especially with Robert Baratheon taking the throne. It is Robert as king, whose questionable rule sets the stage for much of A Song of Ice and Fires plot. Here we offer a number of great Baratheon items, ranging from cool shirts that feature the crowned black stag of the Baratheon crest, alongside pint glasses, shot glasses, and home decor pieces to bring some of the Baratheon style into your home. The black stag is a powerful figure, and in Westeros, it is a symbol that commands respect. Now, the black stag can be worn proudly and displayed openly by all who favor this noble house, just by taking a moment to grab a few items from our Shop for House Baratheon section. Hear me roar! Among noble houses in Westeros, few are as wealthy or as powerful as the Lannisters. Due in part to their great wealth, the family has adopted a second, unofficial motto - A Lannister always pays his debts. There is no debt here, though. 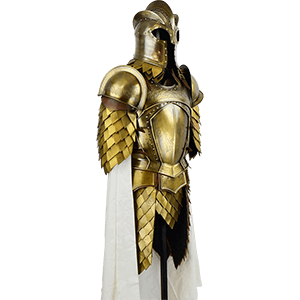 Only an array of great items to be found here in our Shop for House Lannister section, allowing any fan to show off the red and gold of this House. In both the books and the series, the Lannisters are pivotal to the plot, as it is often their machinations, and sometimes their disagreements, that drive several of the plots events. 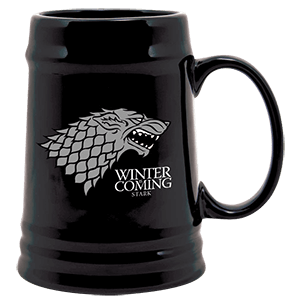 Here, we offer a number of great items, ranging from quality t-shirts that feature quotes about the Lannisters to their classic house emblem, a gold lion on a crimson field. 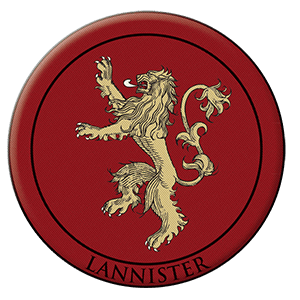 There are also Lannister pins and patches for customizing your everyday garments, and home accessories and accents like pint glasses, coasters, magnets, statues, and more, for adding that touch of style to your surroundings. So if you consider yourself a lion and want to proudly show your colors, the Shop for House Lannister section is definitely a place you will want to visit. We do not sow - Greyjoy. As high as honor - Arryn. Family, duty, honor - Tully. Growing Strong - Tyrell. These are the words and names of the other noble houses in Westeros. And while not always in the forefront of the plot of A Song of Ice and Fire and Game of Thrones, they are often still present and still important to the story. We have gathered all we have of theirs here, in our Shop for All Other Houses section. Here in this section you will find shirts, coasters, book-marks, glassware, home decor and more, all marked with the sigils, the words, and the characters of the other noble houses of Westeros. The Greyjoy Kraken appears here, as does the Arryn falcon, the Martell spear, and the Tyrell flower. No matter what house you might favor in Westeros, you can rest assured that you are likely to find their emblem here, represented in some form. And that makes it easy for you to show your support for any of these noble houses in your home and your life. 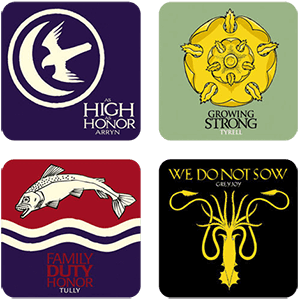 So take some time and see what you can find here in the Shop for All Other Houses section, and maybe show some support for another of the many great houses and families that call Westeros home.